Recognizing that all human activity – including operating a law firm – impacts the environment and natural world around us, we are committed to promoting environmentally sustainable business operations to conserve natural resources now, and for generations to come. The firm embraces sustainability through firm-wide policies and initiatives that reduce our overall environmental footprint. Specifically, sustainability is considered in the purchase of supplies and equipment, the use of recycling and disposal services and the development of electronic policies that minimize paper use. We embrace sustainability by reducing our environmental footprint under the guidance of our Green Committee. We conduct environmental efficiency audits, reduce and recycle waste, promote the paperless exchange of information, and incorporate LEED guidelines into new office space construction. We provide secure bicycle storage space and promote the use of public transportation through financial incentives to further reduce our carbon footprint. Additionally, the firm has teamed up with external organizations to further our sustainability mission and achieve measurable results on our efforts. Our firm is recognized by the ABA-EPA Law Office Climate Challenge as a Law Office Climate Challenge partner for adopting best practices of office paper management. The Climate Challenge is designed to encourage law offices to take specific steps to conserve energy and resources, as well as reduce emissions of greenhouse gases and other pollutants. We are proud of our participation in the Environmental Protection Agency’s WasteWise Program, a program that encourages organizations to reduce waste, including paper waste. As part of our partnership with EPA, we receive the agency’s individualized climate profile for the firm, which translates our annual waste prevention and recycling data into greenhouse gas emission reductions and equivalency statements. In one year alone, our firm’s paper recycling efforts conserved the equivalent of two acres of forest, saving 134 tons of waste from being landfilled. 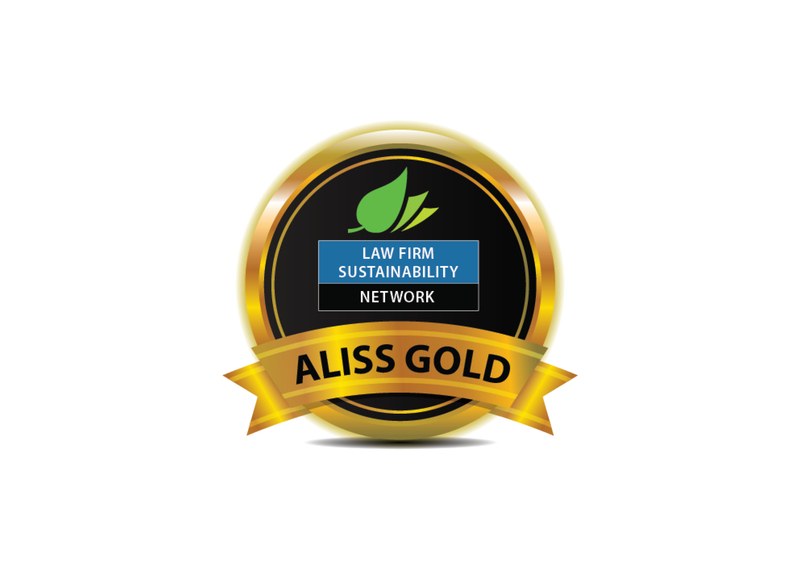 In 2013, the firm joined forces with the Law Firm Sustainability Network (LFSN) to promote environmental sustainability across the legal industry. The LFSN is committed to promoting the benefits of environmental sustainability and corporate social responsibility throughout the legal industry. As a result of our partnership we continue to expand and enhance our sustainability programs and are participating in developing the American Legal Industry Sustainability Standards.